Gender equality and the responsibility of husbands and fathers: issues that loom large today had currency in Renaissance Venice as well, as evidenced by the publication in 1600 of The Worth of Women by Moderata Fonte. 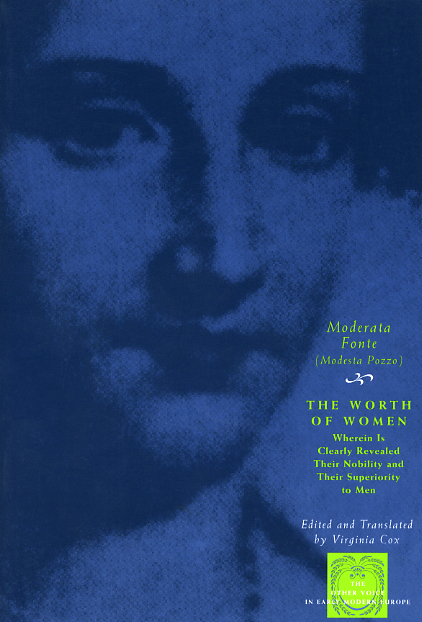 Moderata Fonte was the pseudonym of Modesta Pozzo (1555–92), a Venetian woman who was something of an anomaly. Neither cloistered in a convent nor as liberated from prevailing codes of decorum as a courtesan might be, Pozzo was a respectable, married mother who produced literature in genres that were commonly considered "masculine"—the chivalric romance and the literary dialogue. This work takes the form of the latter, with Fonte creating a conversation among seven Venetian noblewomen. The dialogue explores nearly every aspect of women’s experience in both theoretical and practical terms. These women, who differ in age and experience, take as their broad theme men’s curious hostility toward women and possible cures for it. Moderata Fonte and "The Worth of Women"
The Theme of Women’s Equality with Men in Moderata Fonte’s "Floridoro"